For cosmetic items: premium taunts and skins. Gearbox has spoken previously about its plans to add microtransactions to Battleborn, and those plans come into fruition (well, partly) tomorrow, with an update that introduces the game's premium currency, Platinum. From June 16, platinum can be used to purchase premium skins and taunts, though Gearbox is considering expanding this down the line to let you buy bank spaces, loadouts, or to boost your XP and credit earnings in ways that "do not affect actual gameplay". In comparison to Overwatch's mystery crate purchases, this doesn't seem too bad, given that you can buy these cosmetic items directly—although you will have to purchase Gearbox's Itchy-and-Scratchy-money in fixed 'Platinum Packs' to be able to pay for stuff. 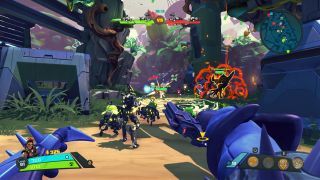 "And remember: as we’ve said all along, we’re stuffing Battleborn with lots of free content across the board – five new, free heroes, competitive multiplayer maps, modes, and updates. Keep an eye out over the next several months as we have lots more content coming down the pipeline for those who own Battleborn."